Oral delivery of insulin is a challenging and unresolved problem until now. The present work aims at investigating controlled release of insulin so as to translate it to a possible and feasible approach for oral drug delivery. 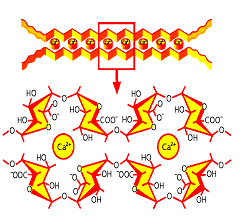 In the present study nanoparticles of calcium pectinate have been synthesized via emulsion crosslinking technique. In this technique aqueous and oil phase solutions were mixed together with vigorous shaking and then the cross-linker was added to this solution with continuous stirring. The prepared nanoparticles were characterized by FTIR, transmission electron microscopy, dynamic light scattering and zeta potential measurements. The nanoparticles were allowed to swell in phosphate buffer saline (PBS) and the influence of factors, such as chemical composition of nanoparticles, pH and temperature of the swelling bath were investigated on the water intake capacity of the pectin nanoparticles. The effects of the insulin loading percentage were examined. The structural integrity of insulin loaded nanoparticles was also assessed by UV spectral study especially under highly acidic conditions mimicking artificial gastric juice.